Choice of: 1,2,3 or 4 outlet kits. Heaters available for boats up to 70ft long. Stainless Steel exhaust and skin fitting. Low power consumption - all important for boats. 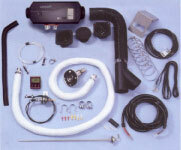 Kits contain all components and manuals to make it suitable for DIY installations. Electronic temperature control and timed operation.